If you are lucky enough to be a frequent traveller to Australia, not only are we jealous of you but now you can earn more points if you are making those flights on Qantas! 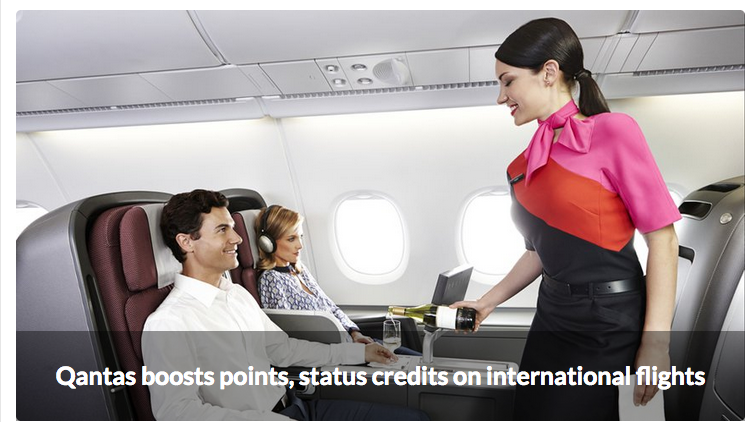 Australian Business Traveller reports that Qantas Frequent Flyer has increased the points and status credits earned on Premium Economy and Business Class tickets from Vancouver, Los Angeles and San Francisco to Australia. Meanwhile they have also lowered some of the points requirements for upgrades out of Los Angeles. Over on our global site, FrequentFlyerBonuses.com we highlighted a very easy way to earn some bonus Club Carlson Gold Points. Via thier app, Club Carlson has added an Extra Partners section where you can shop and earn Club Carlson points for doing so. They are promoting the section by awarding 3,000 Gold Points on your first eligible purchase (many of which only require US$1) and iTunes music purchases seems to be the way to go. The only thing we are unsure of is whether Canadian accounts will work. If you give it a shot let us know how it goes just make sure you are spending enough in C$ to be over US$1 (so I would go with C$1.35 at a minimum). eBay and Groupon also look like easy options for us Canadians. Find out more here. Per this FlyerTalk thread British Airways will be closing their lounge at Toronto's Pearson airport on October 31 and will begin to use one of the Plaza Premium lounges for their elite members and people fliyng in a premium class. Not good news at all as this lounge was one of their better offerings in North America according to many flyers.